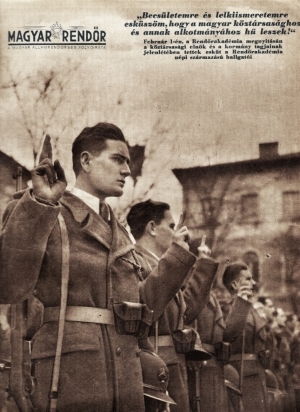 The periodical Magyar Rendőr (The Hungarian Policeman) was launched in January 1947 by the Political Section of the Department of Public Order of the Ministry of Interior Affairs, exclusively for internal distribution. Its first editor-in-chief was police colonel László Marschall, removed from this position in late 1948 and sentenced to death in the Rajk show trial in May 1949. Following his fall, the entire editorial staff was replaced. At first the bi-weekly was published with no photos at all; the first photograph was printed on the cover of a July 1947 issue – six months after the periodical had been launched. Until the end of 1948, only the four cover pages carried intaglio printed photographs, and from 1949 inner pages became illustrated too. At the same time as Magyar Rendőr started to print photographs, full-time photographers were hired, usually 3 or 4 at a time, of whom many stayed with the paper, meanwhile becoming a weekly, as long as for several decades. Checking the very accurately maintained records against the issues of Magyar Rendőr, it becomes apparent that over two thirds of the photos never made into the paper and the majority was never even blown-up. Furthermore, it is clear from the records that one fourth of the negative film strips disappeared altogether (they were not archived, the photographer might have taken them home or might have been destroyed). While the date and the topic of reports or the photographer are sometimes hard to identify, or not possible at all, basic information was preserved most of the time, such as the title, date and place of the series and name of the photographer. 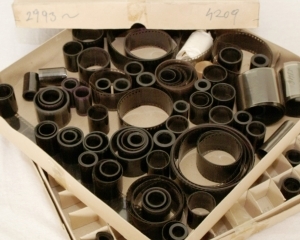 The archivist numbered the film strips in ascending order, making it possible to set the date of those too for which it is not specified in the records. Little is known about the photographers themselves. They were mostly crime scene photographers, good professionals but not artists. Their professional excellence may be the reason why there are surprisingly few failed shots. The best known photographer was Pál Ruttkay, a one time road accidents department officer. When retiring in 1968, hew was called "the chronicler of the force". It is evident from the photos that these reporters literally covered the whole country to document the work of the police and agents of the ministry of interior, the procedures and action taken against citizens. The share of reports made in the countryside (sometimes in small villages) is relatively big; the photographers seemed to be everywhere where the police was, which, especially in the Rákosi era, was omnipresent: children free-riding the tramway, people subscribing for Plan Loan bonds, court trials, agricultural seasonal work, delivery of farm products. While the focus of the collection is life inside the police force (training, briefing, practice at the range, holidays, patrolling, scene of crime officers at work), there is a great number of intriguing photos of the city, of sport events, of everyday life and amazing images of godforsaken lands. What thus becomes visible amidst the innumerable artificially set and false pictures is the reality of communism, as it existed. Between 1947 and 1989, Magyar Rendőr photographers shot over 18,000 Leica cartridges and 6x6 films, producing nearly 500,000 frames in making 20,000 reports. This enormous material, highly varied both in terms of topic and quality, is the documentation of the history of socialist Hungary from the unique perspective of the police. The collection, however, was nearly destroyed after the change of the regime. By lucky chance, the negatives were acquired by the Hungarian Museum of Photography in 1992, and now these photos make up a separate and important section in the museum’s collection. What makes the description of the various series very difficult is that those who were directly involved in or were eyewitnesses of the events are mostly dead, and no sufficiently deep research of the history of the Hungarian police force has been carried out yet. Of the several experts who have participated in producing the descriptions here we wish to name a few and thank them for their invaluable help: Jolán Bikácsi, member of the editorial staff in 1947; Károly Ladvánszky, retired police lieutenant-general, Géza Katona Dr., retired police brigadier and Pál Déri, Dr., founder and editor-in-chief of Rendészeti Szemle (later Belügyi Szemle), another police-related review. We are fully aware that a lot of information is still missing, and in many cases the identity of persons or places is uncertain. We ask all visitors to share with us what they may know about or in relation to the photos. As the search function of the website is based on the accuracy of descriptions, we would be grateful for all additional information, data and comment. At the end of the description of each of the series, the name of the source will be mentioned.